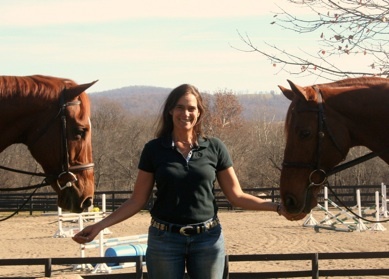 ​Sue Lyman has operated West Riding, a training stable in The Plains, Virginia for more than twenty years. During this time, she has started or retrained many successful show hunters, including Roxdene, Irregardless, El Roy, Movado, and Simbalu, her horse of a lifetime. Simbalu was a thoroughbred stallion who began his career on the racetrack and found his way to Sue. Together, they rose to the top of the hunter divisions. Sue’s particular talents include recognizing potential in young prospects, starting young hunters and jumpers and diagnosing and developing untrained or difficult horses so that they become easy for others to ride. Sue attributes her success as a rider and a trainer to a combination of classical training from superior horseman and using “feel” to direct her. She allows the horse to tell her what they need and what they are ready for. For a number of years, Sue has been working with Laura Rowley, an intuitive healer and animal communicator who has an extensive equestrian background. 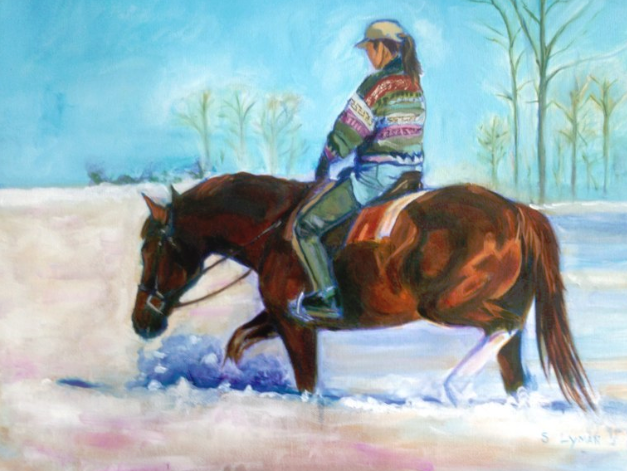 This work has enhanced Sue’s intuitive skills, expanding into her work with horses and riders. Sue is an USHJA certified trainer. She served on the USHJA Professionals’ Committee from 2008-2012. ​Currently Sue serves on the USHJA Horse and Rider’s Advocate Committee. In her youth, Sue Lyman studied art and painted animal portraits on Long Island. Over the years, Sue’s training and developing of young horses led her to find out more about the higher self. She studied energy healing and animal communication. Over the last few years, she studied Reiki and completed her Reiki Master Teachers class in the spring of 2014 at The Cardinal Center for Healing in Fairfax. She also had taken energy healing classes in painting mandalas - spiritual paintings that represent the universe with colors, shapes and symbols. As her mandalas became more detailed, she returned to painting landscapes and animals, especially because always felt the desire to recreate the beauty she was surrounded by in Middleburg. She continues to study other aspects of energy healing. In December 2015 she completed the advanced course in Integrated Energy Therapy with Reiki Master Georgia LaCroix. Reiki and the study of other healing arts has given Sue and way to enhance and grow in all areas of life. The discipline of daily self practice has helped her to cope with chronic lyme disease, and has brought a positive shift in art work, training horses and in family life and other relationships. She loves to share this with others, both human and non human. She began to teach Reiki in the fall of 2014 after be asked by a few people who wanted to learn. Sue is a continuing student of the healing arts and has completed courses in IET through the advanced level with Georgia La Croix. She has also attended a workshop with Caroline Myss on Spiritual Direction. Sue feels particularly fortunate to be part of the community of Artists in Middleburg. AiM has given her the opportunity to grow artistically through painting with professional artists including Gail Guerri and attending workshops with Rob Vander Zee and sculptor Goskin Carey. She feels this group as well as the town encourages artists to express their creative visions and build a community where creative originality is treasured.